A "flipped classroom" is one where students watch lectures at home and do their homework in class. The Kahn Academy has done wonders in helping instructors with flipped classes. I decided to try it with my class that introduces computer programming. My hypothesis: I could get more students to post excellent grades with this method than the traditional method. Over the summer I worked on this website. I put the lectures on-line. A total of 55 videos, over 6 hours of run time. Most videos are short. I used a graphics tablet to mark up the screen during the video. I got a good microphone and edited the videos to remove annoying sounds, mistakes, or other distractions. I created a multiple-choice quiz engine to test the students on-line. That helps make sure they actually went through the material. The website got a lot of positive feedback from the community-at-large, I was helping more students learn programming on-line than I was in the classroom. It seemed like everything ready for a full test of a "flipped" class this semester. The first real results would be from Test 1. I started getting worried when there were students doing worksheets in class that had clearly not watched the lectures or gone over the material first. Plus my "draw a picture" lab had fewer images that really showed off the creativity of what students were able to do. The results of Test 1 confirmed my worries. It showed a noticeable down-tick in grades compared to prior years. Was it terrible? No, there were still a lot of "A" grades. However there were more students on the C-F range than what I normally get. It seemed like a "flipped" class was allowing more students to slip through the cracks than before. My conclusion, the data did not support my hypothesis. Students who don't want to do work outside of class still don't. They gain more from having the traditional lecture in-class and not doing the homework. In a flipped class they skip watching the lecture and just copy worksheets resulting in even less comprehension. Fewer students will become inspired by the material and want to explore a career in that area. Students that aren't willing to ask questions about worksheets have little interaction with the instructor. Those students are less likely to be inspired by the instructor because they don't get to regularly see how excited he/she is about the material. A flipped class will work well in an evening class. Evening classes with working adults have a high drop-out rate for an introductory computer science course. I think that teaching in a 'flipped' manner will result in higher scores for these students even if they result in lower scores for day students. Meeting four times a day, is better than a flipped class, which itself is better than meeting one time a week. The 'flipped' class scales well. It will still perform 'well' with an average instructor and will involve little work on the instructor's part if the material is already created. e.g., a teacher that doesn't understand calculus well can still do a good job teaching calculus with help from the Kahn academy. Or a teacher can have more students in a class and still teach them. But neither can match a great teacher in a small class. At some point I'll do a survey and see if I can't get more information from the class. I'm going back to my traditional methods for now. I am still reaching a lot of students who have never set foot at Simpson. So I don't think the effort spend on the website is a waste. But I'm not improving the scores of my class doing this. You can see that on the lower left are my four Nixie Tubes showing minutes and seconds. Eventually it will just be minutes and hours, but that doesn't make for a good demo video. On the right is the Arduino and LCD shield hooked up to a Chronodot. The Chronodot also has a thermometer. In the background is the power supply. The project is pulling 0.38 amps at 12.1 volts. The software uses this Nixie Tube library, and also this Chronodot library. This will display a value of 0 - 359 for a full rotation of the compass. The SDA line is on analog pin 4 of the arduino and is connected to pin 3 of the CMPS03. The SCL line is on analog pin 5 of the arduino and is conected to pin 2 of the CMPS03. Both SDA and SCL are also connected to the +5v via a couple of 1k8 resistors. A switch to callibrate the CMPS03 can be connected between pin 6 of the CMPS03 and the ground. 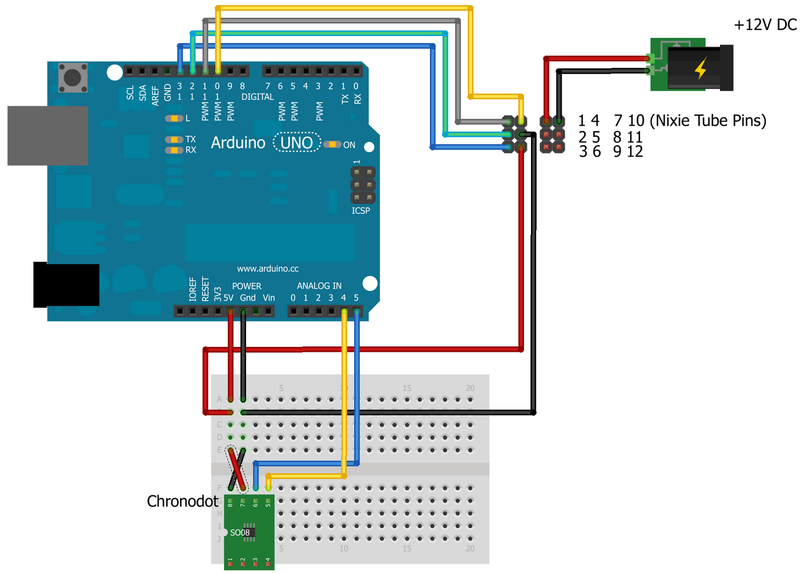 The Arduino microcontroller has finally made robotics work fun. I've worked with other microcontrollers such as RoBoard, Freescale, Parallax, and found them to be more frustrating than fun. The Arduino has changed all that in my case. This shows what I've been able to do with just a few evenings. In the first evening, I was able to get an Arduino board to drive some LEDs within just a few minutes. The ultrasonic sensors had to be polled separately so they did not confuse each other. A bigger issue was the the robot no longer turned well. The front wheel does not turn, and the robot was now heavy enough that the front wheel no longer easily skidded sideways, like it did in version 1.0 of my robot. I'll be adding a magnetic compass soon, and eventually starting version 3.0 of my robot. I get in class new student teachers who need an endorsement that they have taken a programming class. Sometimes these students aren't that interested in programming, they don't see how it will apply to them. 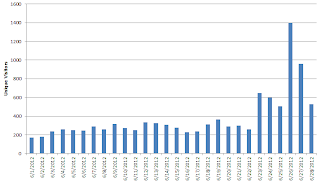 Even more important, according to Google Analytics, about half of the visits are returning visitors. 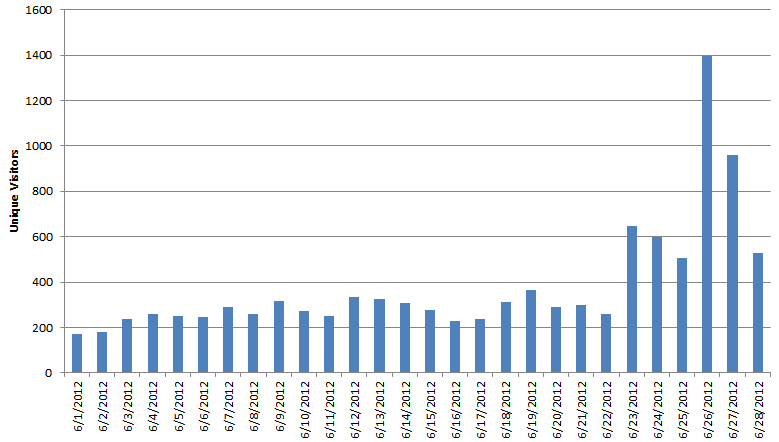 During the month of June I've had over 1,300 visits where more than ten minutes was spent browsing the site. About 500 of those spent more than twenty minutes on the site. I am reaching more students on-line than I am in the classroom. I recently purchased http://ProgramArcadeGames.com for my on-line book on how to program. A couple posts to reddit.com have brought in a lot of traffic. I'm hopeful that the new website address will help bring in search traffic.